Enjoy the nutty flavor and tiny crunch of these blue-black seeds on breads, pretzels and muffins as well as salads and noodles. Fold them into cake batters, or grind them to stir into sauces. These seeds have a high oil content, and although the oil is relatively stable while the seed is intact, refrigeration will slow the oxidation process and prolong the life of the seed. These seeds like other dried seeds may germinate under proper conditions. However, herb and spice seeds sold by Frontier are not intended for sprouting purposes and in many cases will not germinate. 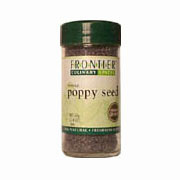 Poppy Seed Whole is shipped in a discrete, unmarked package. Orders are processed immediately and usually take about 3 to 5 working days to be received. We do ask that you try it for 2 to 3 weeks to feel the full effects. Any information received is used only for order processing and shipping purposes. Your information, such as e-mail address, will never be disclosed to a third party.